Whenever we find a reason to drive north toward Delaware, more often than not, after passing I-270, we follow old State Route 315, also known as Olentangy River Road. It may not be as fast as the parallel U.S. Route 23, but its two shaded lanes are much more scenic as they follow the course of the river. That was the path we followed as we entered the county on a cold March morning. In the past, we’ve been rewarded with sights of deer, turtles sunning themselves on logs, and great blue herons wading in the shallows. We even saw a single car accident in real time when it flipped over onto its top. Anything is possible on old 315. There were no airborne vehicles on this particular Saturday, but Michele did spot a kingfisher as I navigated the winding road. Just before we would have met with Route 23, a few miles south of the county seat, we turned off onto Bunty Station Road. That led us to Liberty Road and the Stratford Ecological Center, a private non-profit organization that dedicates itself to the admirable task of educating “children and adults in understanding the relationship between living things and their environment, thereby fostering an appreciation of the land and all life that depends on it.” Its 236-acre organic farm contains a combination of animals, agricultural fields, and woods. We arrived for the 8 a.m. seating of the Maple Sugar Pancake Breakfast, an annual fundraiser where visitors are able to start their day with homemade whole wheat pancakes, Stratford sausage, and local maple syrup. I estimated there were about 80 other diners with us that hour, with additional like-sized groups planned for each of the following four hours. After our breakfast, we walked along the trail leading to the Sugar Shack, passing lines of maple trees being tapped for their sap. Inside the shack, we saw how the sap was then boiled down to syrup. On our return stroll, we stopped at one of the barns and got a closer look at their herd of llamas and goats. Back in the car, we backtracked a bit on Olentangy River Road and crossed the river at Hyatts Road so we could reach Taggart Road. The latter is only about a mile and a half long, but it follows the course of the river on its east side. Early settler Ebenezer Gray Taggart owned a 96-acre farm in this area in the mid-19th Century and the road was probably named for him. He’s not a close relative that I’m aware of, but I still enjoy having my picture taken with signs containing my surname. I’d planned a short hike through Seymour Woods State Nature Preserve, but we couldn’t find a safe place to pull our car off Winter Road near its gated entrance, so we drove east to Route 23 and south a couple miles to Lewis Center Road. Continuing east, we drove toward Alum Creek State Park, where the road then dips and bends around the southern end of the reservoir. We turned into the parking lot at the Lower Dam Recreation Area and came face-to-face with the imposing Alum Creek Dam. In the parking lot is an historic marker paying homage to the forgotten community of Africa. In 1824, when Samuel Patterson settled here, the area was known as East Orange. Patterson, an abolitionist, helped hide runaway slaves in his home. He also invited anti-slavery speakers to spread their message at the local Methodist church. When a pro-slavery neighbor tried mocking Patterson and his like-minded friends by calling their community Africa, they simply accepted it and had East Orange renamed. 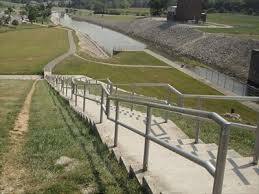 Michele and I climbed the steep steps up the side of the dam, passing a very absorbed jogger who ignored our greeting. Once he reached the bottom, he turned and jogged back to the top of the dam, and then dropped to the ground and did pushups, his black winter coat and water-repellant pants slapping against the hard concrete with each repetition. If I was so intent on physical exertion on a cold winter morning, I, too, would probably ignore those around me. A mile south of the dam on Bale Kenyon Road sits the Delaware County Bicentennial Barn, a century-old barn that can be easily seen by southbound drivers on Interstate 71. The state’s 2003 bicentennial celebration doesn’t feel all that long ago, but many of the barns that were painted then with the bicentennial logo are now gone or have been repainted. What was once a common sight, now feels like a special gift from the past. We pulled off the road at the wagon wheel gate that blocks further progress. I snapped a quick picture of the russet wood barn before looking both ways, twice, and backing out onto the road. We returned to Lewis Center Road and drove east as it changed names to Big Walnut Road. At State Route 3, we turned north and skirted a couple of golf courses while staying to the west of Hoover Reservoir. At Cherry Street, we turned east into the small town of Sunbury and pulled over at the cute little town square. Not only is a Civil War statue a point of interest, but also the large boulder on which it sits. The man memorialized atop a bronze horse is Civil War Major General William Starke Rosecrans, whose resume was long and impressive. Besides being born in Delaware County, he graduated from West Point in 1842, and was an engineer, architect, and inventor when he wasn’t commanding the Union Armies of the Ohio, the Cumberland, and the Missouri. “Old Rosy” later served as Minister to Mexico and as a United States Congressman from California. He’s buried in Arlington National Cemetery. Of possible interest to Columbus Catholics, his brother, Sylvester, was the first bishop of the Columbus Diocese. The base of the statue is a 40,000-pound rock known as a glacial erratic, a large igneous rock formed from ancient volcanic magma more than 2.5 billion years ago. More recently – between 10,000 and 110,000 years ago – these erratics were pushed into central Ohio from northern Ontario by the Wisconsin glaciers. The erratic which eternally props up General Rosecrans is said to be one of the five largest erratics in the state. That, of course, begs the question, “Where is the largest erratic in Ohio?” Fortunately, it’s located nearby, only a mile or so east of Sunbury, about a tenth of a mile north of Hartford Road. It’s an oval-shaped granite boulder 22 feet long, 18 feet wide and 8 feet high with a circumference of 72 feet. The weight of the exposed portion of the erratic is about 200 tons. Unfortunately, it sits on private property, so we couldn’t get a close-up view, but when a rock is that big, it looks massive even from afar. We continued our tour of Old Rosy sites north of Sunbury on Rosecrans Road. West of Blue Church Road, on the south side, sits an easy-to-miss plaque attached to a rock and enclosed on three sides by a black metal fence. A half dozen small American flags help decorate the General Rosecrans Memorial. The words on the gold-framed marker, erected in 1940 by an American Legion post, record the General’s birth and death dates and explain that the memorial marks his birthplace. I assume the Rosecrans homestead once stood nearby and that Old Rosy wasn’t hatched just outside by the side of the road. Continuing north on State Route 61, we turned east onto Chambers Road to find the only covered bridge in the county. Aptly named the Chambers Road Covered Bridge, it spans Big Walnut Creek and can still be driven over, which is pretty amazing considering it was built in 1883, but more believable once I learned it was renovated in the early 1980s. The foundations were rebuilt and a concrete center pier added. A steel substructure also ensured the bridge could carry the weight of motor vehicles. The inside wooden planks are colorfully festooned with the usual graffiti informing travelers of who loves whom. A budding artist also tried his hand at male genitalia representation; either that or a dachshund with big round ears. Apparently, I’m logistically-challenged because after visiting the covered bridge in the northeast corner of the county, I decided the next item on our itinerary was a restaurant in the southwest corner of the county. We followed State Route 42 mostly south and west around the county seat and across the Scioto River. Turning south on Dublin Road, we drove to the small community of Shawnee Hills where we found the Morgan House restaurant. The eatery is built around an authentic log cabin that originally stood in Morgan County, Ohio. The founders of the Morgan House had the cabin moved to its current location in 1985 and named the restaurant for John Hunt Morgan. I find it “interesting” that the website, in giving the restaurant’s history, describes Morgan as a “famed Civil War veteran,” and gives a brief biography of the man that only covers his pre-Civil War life. He was in fact a Confederate general who led a raiding party of 1,000 troops through southern Indiana and Ohio in 1863. He was eventually captured and sent to the Ohio Penitentiary, from which he escaped. He was shot by Union troops in Tennessee a year later. Why name a restaurant near Dublin, Ohio for a Southern general? It is believed that Morgan may have stayed at the Morgan County cabin during his raid. Laying history aside, Michele and I picked up menus and enjoyed a delicious lunch. I started with a cup of tomato basil soup before moving on to the daily special, an open-faced turkey club sandwich on Texas toast. Michele ordered the Morgan House soup, a “thick chicken cream-based soup with celery, onions, mushrooms, white wine, and black wild rice that features dominating flavors of sherry and curry,” and the Basket Lunch, which included a chicken salad sandwich with fruit and chips. After our meal, and a quick perusal of the extensive gift shop in the Morgan House, we drove east along Glick Road atop the O’Shaughnessy Dam, and then north along the reservoir on Riverside Drive. Fun fact: The O’Shaughnessy Reservoir, along with Hoover Reservoir, also in Delaware County, and Griggs Reservoir in Franklin County, supply 90% of the City of Columbus’s daily water needs of 140 million gallons. We entered the county seat of Delaware along Sandusky Street, passing the campus of Ohio Wesleyan University. We found a parking spot on West Winter Street and proceeded on foot to investigate some of the local businesses. Our first stop was Endangered Species, The Last Record Store on Earth. It’s also sometimes shortened to Pat’s Record Store for owner Patrick Bailey. Perched behind the counter, the long gray-haired proprietor appeared just how you might imagine someone who has been in the record trade for 40 years to look. On a previous visit, his friendly banter included some affectionately-intended (??) mocking comments regarding our purchase of an REO Speedwagon greatest hits cd. Our selections this time of “The McGarrigle Hour” by Kate and Anna McGarrigle, and Hayes Carll’s “KMAG YOYO” escaped editorial comment. Across Winter Street from the record store is Bun’s Restaurant, a local institution since 1864 when it opened as a bakery. We’d eaten there on a previous visit to Delaware and our present county trip meal dance card was already full, so we had to give Bun’s a miss this time, but I’d recommend it to others. The neon “Bun’s Restaurant” sign that hangs from an arch over the middle of the street makes it easy to find. There are plenty of shops to check out on Sandusky Street, but we spent our time in the city’s two main antique stores: Sandusky Street Antiques and Delaware Antique Mall. The former offers a nicer, higher end selection of goods, while the latter is larger and features more varied pickings. We came away however, without any purchases. As the clock neared 4 p.m., our agreed upon check-in time for our night’s lodging, we returned to our car and made the short drive to the west end of the street and parked in front of the Winter Street Inn, a 142-year old Victorian-era home that was converted into a bed & breakfast by owners Rodger and Debbie in 2006. Rodger met us at the door and led us upstairs where the Humphries Room awaited us. Named for a previous owner of the house who owned a thriving Ford dealership, the room featured silk wallpaper, an antique Persian rug, and a comfortable king-sized bed which provided us a spot for a late afternoon siesta. It was dark by the time we returned outdoors. We left the car behind and walked down Winter Street, appreciating the architecture of the Italianate homes that filled the lots, many of which appeared to be serving as frat houses, or were owned by people who liked decorating their facades with large Greek letters. We stepped into the Staas Brewing Company, Delaware’s first (and only?) brewpub. We sat at stools at the bar and requested a couple of porters; an 8% Baltic Porter for myself and a 6.4% Vanilla Porter for Michele. Most of the chairs in the bar were occupied, mainly by folks who could have been grad students or parents of students from nearby OWU. The television screens were muted, but contained sports-related programs. The beers were good and the ambiance was relaxed and inviting. For a total contrast in clientele, our next stop was the Hamburger Inn Diner on Sandusky Street. It’s another longtime Delaware institution, dating back to 1932. Closing time is 10 p.m. or midnight during the week, but its open all night on weekends. Most of the stools at the U-shaped counters were occupied when we entered, but we found a couple at the back of the restaurant. Fox News was playing on the television and a Blue Lives Matter flag was displayed opposite an American flag. There were lots of tattoos and piercings and overheard drama about people doing other people wrong. And that was just the staff! But everyone was friendly and helpful and the food was good and exactly what I was expecting. I had a cheeseburger and Michele had a chili dog. We shared our sides of onion rings and waffle fries topped with bacon and cheese. Feeling a bit stuffed after our meal, we rolled south down Sandusky Street and around the corner onto William Street. We paused at a historic marker memorializing the birthplace of Rutherford B. Hayes, nineteenth president of the United States. The marker was erected in 1926, the same year the Hayes home was torn down. In its place is now a BP filling station, referred to on a website I came across as the Rutherford B. Hayes Birthplace Gas Station. Continuing around another corner, we found Roop Brothers Bar, or Roops, as the locals call it. “Where live classic rock and blues music lives!” The building is a nondescript red brick structure with stacked beer barrels out front. Inside, the mostly middle aged crowd was preparing for a night of good rockin’ with local favorites, The Stolen Fire. The band was formed in 2011 by four professors from Ohio Wesleyan University. I stepped up to the bar before the music started and ordered a pint of Brew Dog’s Radio Zombie Phone In, a Russian Imperial Stout. I noticed most of the other drinkers were ordering their brews in cans and bottles. There was also Jägermeister available on tap! We stayed for about an hour, listening while the band ran through a series of Zeppelin covers followed by “Pinball Wizard” and Bowie’s “Ziggy Stardust.” They sounded good and the crowd was into them. After my nursed beer finally emptied, we stepped into the nippy night and strolled back to our B&B. We slept soundly. I awoke the next morning early enough to shower before breakfast. The bathroom for our room was so small, the washbasin was located outside it, near our bed. As I sat on the toilet, I was mere inches away from the mirror that hung from the back of the door. While performing my morning necessary, there was the spitting image of myself, pants down around his ankles, gawking at me. It was a bit unnerving. I’d look away, but every time I snuck a peek, there I was, still staring. Promptly at 8 a.m., we descended the winding staircase to the first floor. In the dining room, Rodger already had our places set. There was a bowl of mixed fruit and granola in yogurt, and on a side plate, a cherry-filled donut. Coffee and juice filled our cups and when we were ready, the main entrée was brought out consisting of a sunny side egg atop a muffin, accompanied by slices of melon and pineapple. After our meal, we hung out in our room for awhile, getting our money’s worth. At 11 a.m., when we checked out, teeny random snowflakes had begun to fall. I snapped a photo of our B&B as well as the building across the street, the former George W. Campbell home, which was originally built in 1854. It was designed with Romanesque and Norman Revival architectural features which included a round tower and arched windows and doorways made of locally-mined blue limestone. It now serves as the Delaware County Cultural Arts Center. We drove northwest out of Delaware along West Central Avenue and then veered north on State Route 203 up to the village of Radnor for another architecturally unique structure. At the entrance to the local graveyard is the Radnor Cemetery Lych Gate. Traditional in England and Wales, lych gates are covered gateways used to shelter coffins until clergymen arrive for burial. The Radnor version was designed by a local architect over a century ago to commemorate the early settlers of the town who emigrated from Wales. It’s built of locally-quarried stone and features two openings: a larger one for a horse-drawn hearse and a smaller one for mourners. The gate was also given a tower resembling a church steeple to give it an ecclesiastical style. We drove east from Radnor for about four miles until arriving at U.S. Route 23 about a mile north of the entrance to Delaware State Park. I thought a little outdoor exercise might work off our morning donut. We wound through the park before stopping near the camp check-in station. Near there was the beginning of the Lakeview Trail. For awhile, the path was dry and pleasant. The sky was a solid cloud, but we could see Delaware Lake. The lake was formed in 1951 after the construction of a flood control dam. The state park was dedicated a year later. Once the trail looped away from the water on its way to connecting to the Briar Patch Trail and the return to the parking lot, big muddy patches began getting in our way. We tried walking around them, but the sides of the trail were lined with briars and needle-filled plants. The Sunday morning stroll became a slog as more and more sections of the trail contained standing water. One can attempt to be very Zen about it all and concentrate on a particular mantra to distract from the trail conditions, but when that repeated word becomes, “fuckfuckfuckfuckfuckfuckFUCK!” then you realize your attempt at serene meditation is, well, in a word, fucked. After a couple miles of less than ideal hiking, we arrived back at the lot and spent some time scraping off the brown slop that had caked to our boots before allowing ourselves back in the car. As we drove back to Delaware, the snowflakes hitting the windshield became bigger and wetter. We had made plans to meet my sister and her daughter at the 1808 American Bistro at 1 p.m. for Sunday brunch. Katanya and Jennifer introduced us to this very fine restaurant a year ago and we looked forward to returning. I considered myself lucky when I spotted an open parking spot directly across the street. After we parallel parked, the car behind pulled up next to us and rolled down a window. My sibling and niece were inside and were a bit miffed because they had seen a car vacate that prime parking spot and had quickly driven around the block so they could get it. “Sorry!” I weakly responded, although I couldn’t stop laughing. Once we sat down to eat, all thoughts of stolen parking spaces were forgotten as we were all easily distracted by the food. The restaurant has been open for over a decade and has a deservedly good reputation for its Sunday brunch. I had the shrimp and grits which was outstanding with shrimp and andouille sausage bathing in polenta and a creamy Cajun sauce. We all enjoyed a leisurely two-hour meal, which was long enough for a layer of snow to accumulate on the windows of our cars. We said our goodbyes and swept our vehicle of snow and drove a few blocks away to the Richard M. Ross Art Museum on South Sandusky Street. It’s housed in OWU’s Humphreys Art Hall, a former United State Post Office building. I was looking forward to seeing the current exhibit, “Yesterday, Today, Tomorrow,” a collection of curated works by African American artists and artists from the African Diaspora. When we entered the museum, we saw right away that there was some sort of to-do taking place. There were lots of well-dressed people milling about and socializing. (We later learned the Delaware Community Chorus was hosting a reception for its donors.) Michele was hesitant about proceeding, but I really wanted to see the art and figured so long as we weren’t turned away, we could still do so. Michele’s misgivings were reinforced when we were somewhat strong-armed into wearing nametags. I acquiesced quickly on the assumption that we’d be less conspicuous if we had nametags like everyone else. I was wrong. We were both greeted by name by complete strangers on multiple occasions. I’m not particularly fond of being so familiarly hailed by someone who doesn’t know me. We did our best to circulate through the galleries, but it was near impossible at times as the hors d’oeuvres-munching, wine-swilling crowd didn’t seem to have a problem socializing directly in front of pieces while completely ignoring the art. Michele later told me she did her best to display a demeanor that said, “Leave me alone,” but was unsuccessful time and time again. Apparently, whatever talents the Chorus possesses in singing and fundraising far exceed the ability of its members to read body language. I can’t imagine we resembled the normal philanthropist, what with our attire of cargo pants and mud-caked boots, but perhaps we were mistaken for the reclusive and deep-pocketed donors, Mr. and Mr. “Anonymous” who always appear at the top of contributor lists. So the conditions were far from ideal, but we did our best to circulate through the rooms and actually look at the art. There were a few artists represented with whom I was previously familiar such as Aminah Robinson and Kojo Kamau, but there were also many who were new to me. It is always a pleasure to discover a new favorite. One example was the “First Avenue” triptych by Don “DonCee” Coulter, but the artist whose works may have made the biggest impression on both Michele and myself was Percy King. OSU football fans may remember King as the safety who blocked a punt for a touchdown against Penn State in 1998. 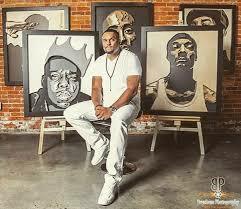 After a brief stint with the Kansas City Chiefs, he turned to another passion of his: art. What he has since named, “Shaolin Wood Technique,” his works incorporate layered sheets of compressed composite wood. The results are very cool-looking 3-D portraits of prominent cultural figures from Langston Hughes to Snoop Dog. By the time we completed our tour of the exhibit and escaped to our car where we were both anxious to compare our museum experiences, the snowfall had increased in intensity. Road visibility approached white-out conditions as we drove south on U.S. Route 23. I’d originally planned on ending our weekend with a hike in Highbanks Metro Park to see a couple of Adena mounds, but the weather situation forced a change. We just kept driving south and soon exited the county.